MSRP: Starting at $45,347 USD. All aluminum for the Toy enthusiast! 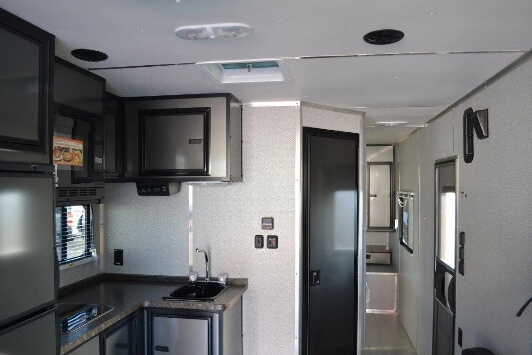 New trailer by the – Livin’ Lite RV Inc. There is no wood, this is an all aluminum trailer. The Trailer is 30′, is an easy pull and has a great design. 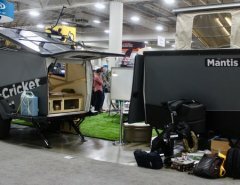 This is like a cargo trailer and camper all-in-one. 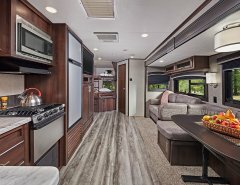 The Livin Lite is mostly garage with a little bit of RV. Truly lightweight trailer can be hauled by any small truck and SUV. 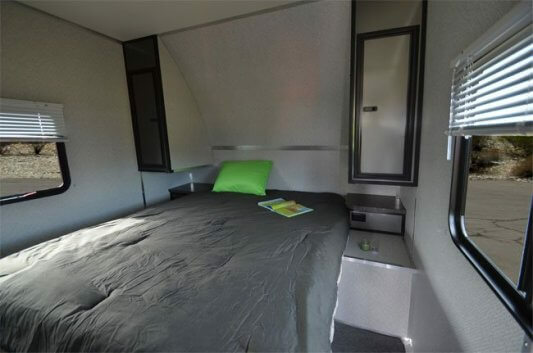 Custom colors are available unlike many trailers/RV’s. 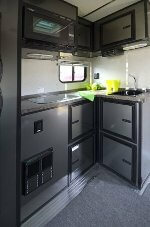 Front storage, pass-through side-to-side, stone guard panel, locking front storage doors with kitchen and in-and-out tables, large rear ramp with 2500 lb. weight capability for your toys with locking security guards, 2 spot lights, custom wheels, 12v lighting and plug, interior tie-downs, spacious, includes AC and window blinds. Interior is sleek, clean and durable. All heavy grade aluminum steel interior and exterior will last for a lifetime; this is a trailer you can hand down to your children! Trailer is fully styrofoam insulated with beautifully finished aluminum skin cabinets with durable snap locks. 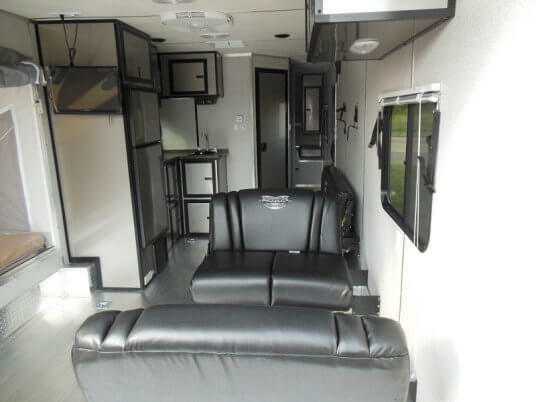 Clean aluminum interior and flooring comes with carpet mats to put down with easy removal. No rust throughout; you can even hose off interior to clean! All aluminum flooring means no gas leaking into a plywood floor. Galley kitchen has microwave and large 3-way fridge, sharp looking snap locks on all cabinets, as well as deep, well-supported storage cabinets, one extra large cabinet with a hanging rack, deep lower and upper cabinets, large all steel storage under 2 burner flip top stove, and another under the sink. Removable kitchen and in-and-out tables will lock in outside storage. 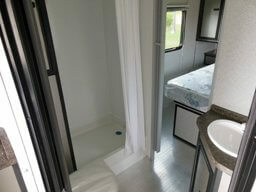 Bathroom has shower stall, locking upper storage cabinet and step flush toilet. Two dinette benches fold down as well as large folding bench seating for sleeping. Queen size electric bed at ceiling moves down for sleeping, tucks up and out of the way. 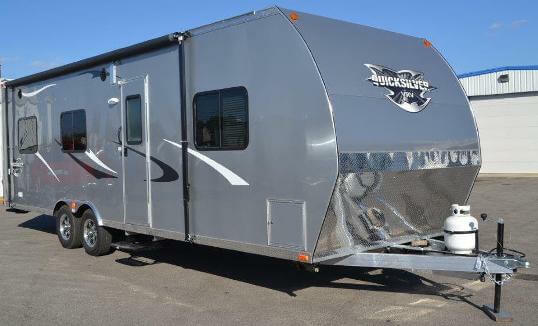 A unique, affordable toy hauler for use with your current vehicle. 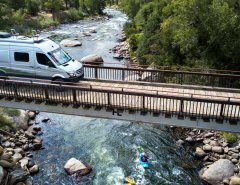 This is the new generation Toy Hauler that lives up to it’s name: VRV Versatile Recreational Vehicle. EXTREMELY LIGHTWEIGHT DESIGN — Towable by Most Trucks & SUVs!